TGIF. It's freaking Friday, time to blast the music and polish the night away. Okay, so that's what I do every night, but still I am happy for the weekend. Moving right along though, today I have another collection throwing me way back into my childhood. 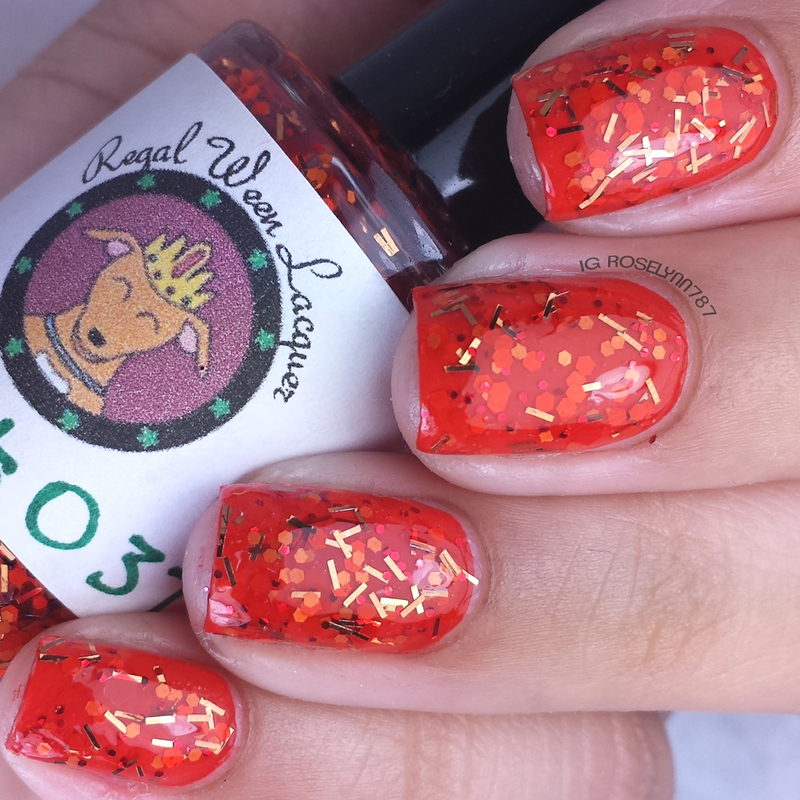 Say hello to the Gotta Catch'em All Collection by Regal Ween Lacquer! This set consists of four glitter toppers based on some of my favorite Pokemon from the beloved series. The Gotta Catch'em All Collection by Regal Ween Lacquer is a limited edition set that is now available for purchase. What's even better is that right now all of these are available at sale price $5.50 each ($4.00 for Gengar) for a full size bottle! The complete set of four in full size bottles is also available at sale price for $18.00. 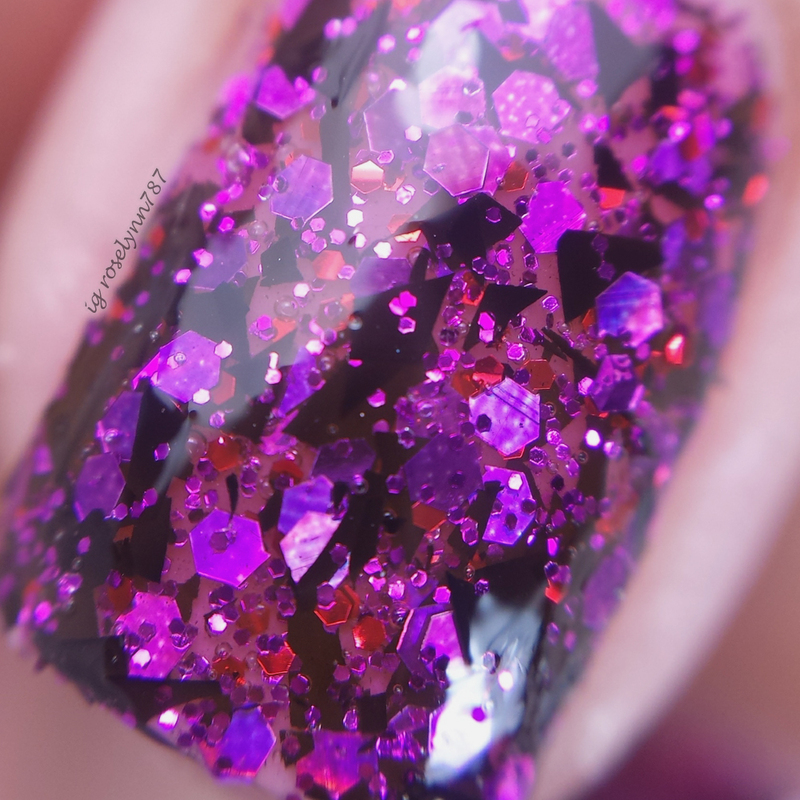 Gengar is a glitter topper with holo purple hexes, purple ultra fine glitter, red mini hexes and black shreds in a clear base. Talk about a glitter explosive! Unfortunately the glitters in this polish do bleed and cause the clear base to have a pinkish tint. The price for this one has been reduced as well due to the bleeding. If you plan on layering for full coverage, the tint ends up working out but otherwise you'll have to be wary of the base you choose. I opted for a full coverage look by applying one thin layer and then dabbing on an additional layer or two. The formula for this is very thick and chunky. The consistency makes dabbing the layers a must for a smoother finish. I sealed off my swatch with two layers of Seche Vite topcoat because of the massive amount of glitters. 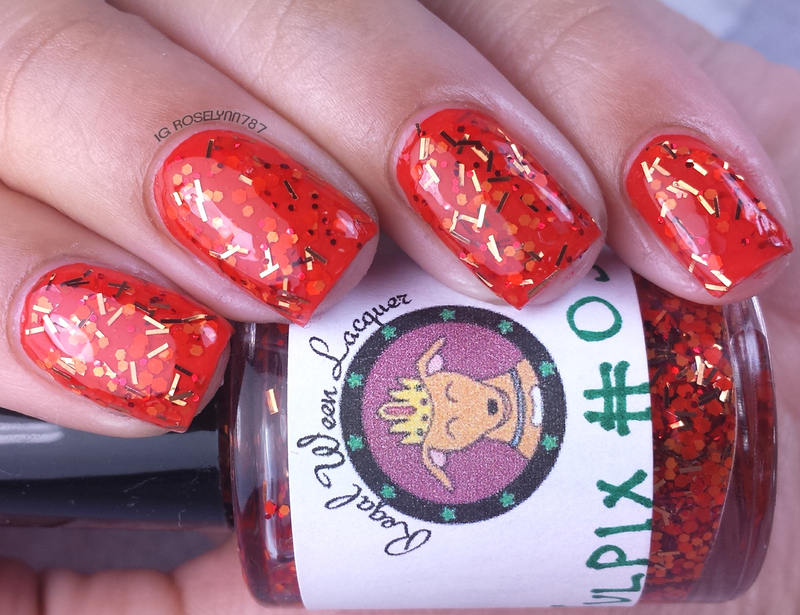 Vulpix is a glitter bomb with two shades of orange hexes, mini red hexes and copper bars in a clear base. Doesn't this just look fiery? The color to glitter combination is the perfect representation of the Pokemon. The formula is much better, however the consistency for the glitter base is a little on the thin side. Because of the thin consistency I had a bit of a hard time spreading the glitters evenly and in some cases they tended to clump together. For these swatches, I used two thin layers over a red base color and sealed it off with Seche Vite. Lapras is a glitter bomb that has powder blue diamonds, matte gray hexes, holo blue squares and white holo dust in a clear base. I am simply blown away by how beautiful this glitter-bomb is! It has a very aquatic/frozen type of feeling to it. Definitely my favorite among the four-set. 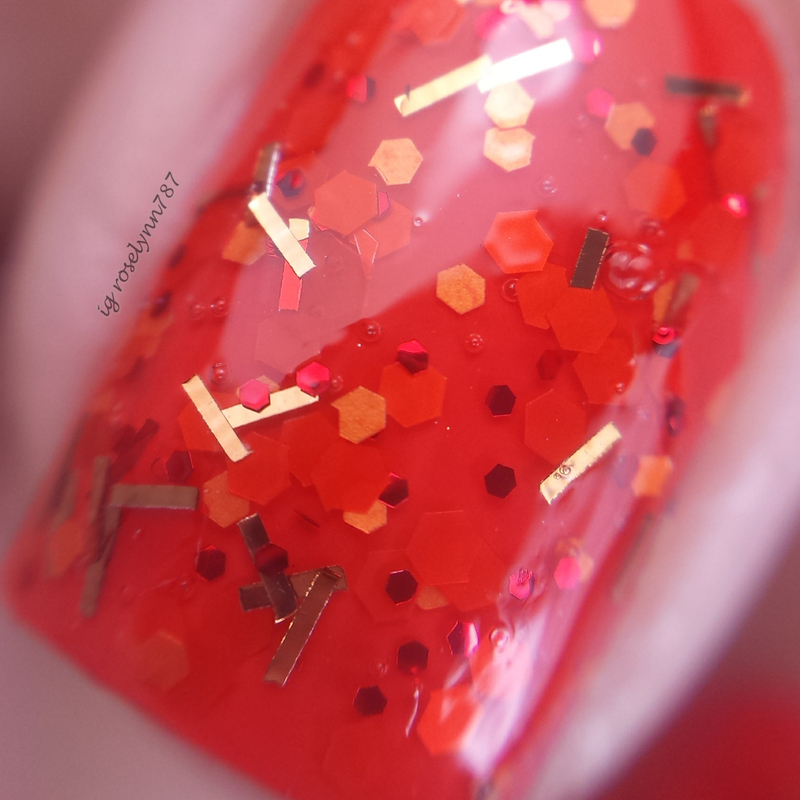 The formula and consistency for this one are both spot on for the heavy glitters. Not too thick or too thin, each layer applies evenly throughout without the glitter clumping up. For these swatches, I used two thin layers over a bright blue base color and sealed it off with Seche Vite. 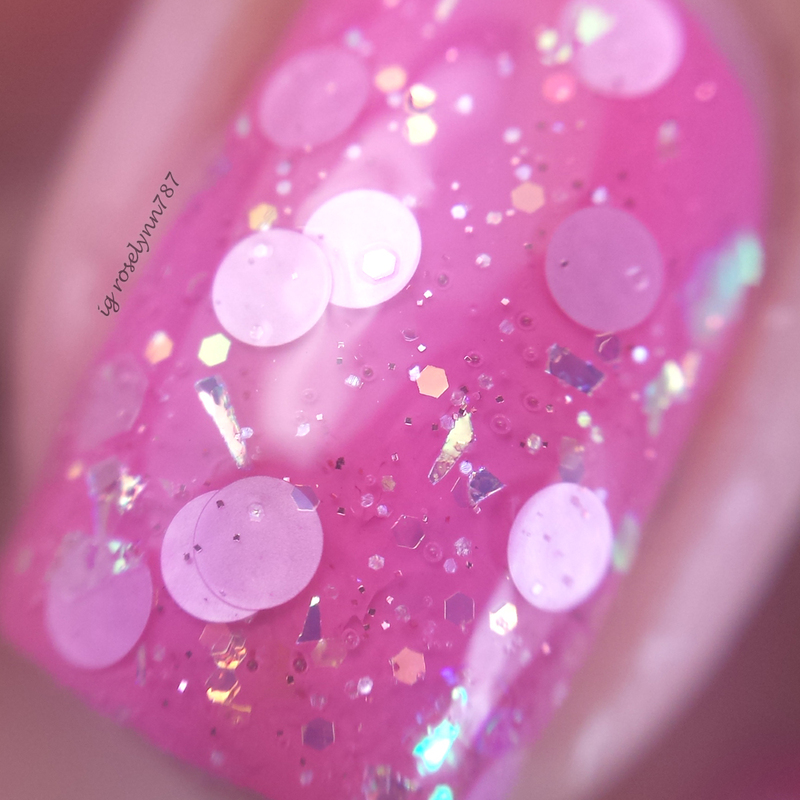 Clefairy is a pink circle glitter, white holo dust, iridescent shreds and hexes, and pink ultra fine dust in a clear base. The iridescent shreds add such a nice touch to this one, it sets a tone for that magical vibe. The formula for this one was good, except there was minor fishing involved for the larger circle glitters. Considering the largeness of the glitters, I was pleasantly surprised that the application was not thicker. For these swatches, I used two thin layers over a pink base color and sealed it off with Seche Vite. Overall I find myself in a love/hate relationship with these glitter toppers. Although I love the end result, I hated the process of getting there. The glitter toppers were a bit tough to work with until you get the hang of the consistency. Lapras and Clefairy had the best application among the four-set and applied without having to dab. That said, I can see myself wearing these as accent nails to a simple manicure but probably not as a full mani themselves. As I mentioned before, the Gotta Catch'em All Collection by Regal Ween Lacquer is available at sale price $5.50 each ($4.00 for Gengar) for a full size bottle. The complete set of four in full size bottles is also available at sale price for $18.00. Tell me guys, did you ever like Pokemon as a kid? Have a nice weekend! Oh, Gengar, how I love you so. Have to admit I was never much of a Pokefan, but I did love Jigglypuff and Squirtle on the tv show. Of course, that was about a million years ago, and I'm probably totally uncool for picking common characters. I love this! The Clefairy polish is a cute as the Pokemon! These colors are gorgeous! Thanks to my son, I know all these characters, too. Pokemon are so cute. Clefairy looks like tiny bubblegum bubbles. lol I like it! I'm not sure if Pokemon was around when I was a kid lol. I have a son that loves Pokemon though. =) Love these colors! These are all amazing. I'm not sure which I like better. But, I know for a fact my girls would flip out for all of these! Your nails are so beautiful. Pokemon was not around when I was a kid but my for my children it was and they still love it. I really love the added glitter sprinkles and designs! That is what really makes those nails pop! I can't paint my fingernails due to where I work, but I really wish I could! That blue is so pretty! I love these. They are all beautiful but I really love the pink. I wish I was good at painting my nails. Oh wow, your nails look amazing, i particularly like the pink one! Clefairy #035 looks gorgeous. Pokemon nail polish colors?! Oh man, I love this so much. The Vulpix one is gorgeous! Lapras is my favorite as well - the diamond glitter is so pretty! I'm too old to know these Pokemon characters. Think I was in my late teens when Pokemon blew up in our country. Pity about the formulas cos these are really gorgeous! Your swatches are AH-mazing! What pretty polishes at such a great price! As a kid? Shoot, I still love Pokemon!!! These polishes are so clever!! Gorgeous swatches! I never got into Pokemon, but these glitter toppers are very cute on you. I actually really like how the first one looks at full coverage. These are really cute! I never really got into Pokemon, but my husband was really into it when he was younger. Now my son knows some of them from other games like Smash Brothers for the Wii U.
I guess it's high time I get some of this for my daughter. I know she'd love to have it. I LOVE glittery, sparkly nail polish!! You killed it on this one girly!! Great job and gorgeous nails!! These colors are so fun! I love how great they'll be in the summertime! I usually put some sparkle on one of my fingers to "dress it up" a little bit! Extra glitter for me please! That pretty purple polish is so nice! I need to try some of these colors! I really like the first one, but it seems like you would definitely need a peel off base coat! Thanks for the honesty. I hate when you have to work WAY too hard to get anything on the nail. It's frustrating. I love these colors. The Gengar is my favorite. I love to change my polish a few times a week. My son loved Pokemon when he was little. These are cute but I just don't love glitter toppers. 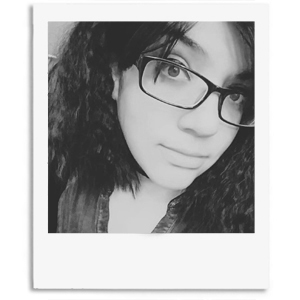 Genger is so pretty though! Pokemon was after my time, but i know people loved it. Glitter toppers are hit and miss for me but I think these are pretty. Those are really pretty nail polishes. I love the Vulpix most of all. And that's because red is one of my favorite colors. Gorgeous! I love Gengar, it's so deep and lovely! I'm not a fan of glitter toppers, but your swatches are breathtaking! Pokemon was big with my younger brothers, me not so much. So I totally love all of your nails again! However, if I have to pick one, I would have to go with the red! Ohhhhh Gengar, I have no idea what inspired you, but I do love you as a polish! Gengar is definately my favorite by the looks. I always have such troubles with chunky glitters and getting the right look. Genger would definitely be my pick! These are absolutely gorgeous nail polishes. The green and the purple shades are my favourites.